To really know the taste of wines from a certain place - this is not an easy thing for most of us. If you are fortunate enough to drink many examples over many years, it becomes possible. When trying to learn about terroir, Champagne presents challenges that Burgundy, for example, does not. Although the majority of Burgundy wines are of the regional or villages classification, single vineyard bottles are so widely available that your local wine shop doesn't have to be particularly creative to stock them. There are nowhere near as many single vineyard Champagnes on the market, although the number is growing. Most often when we drink Champagne, we drink a blend of wines from several parcels of several vineyards, perhaps even from several different villages and vintages. Add that to the fact that Champagne must be crafted in the cellar in a way that most still wines are not, it is easy to understand why some people do not consider Champagne to be a wine of terroir. It may be understandable, but it is simply wrong. Just because it is challenging to discern Champagne terroir does not mean that Champagne is not a wine of terroir. It requires more experience, and I would say more commitment on the taster's part, to understand Champagne terroir. I most certainly do not understand it and I drink as much Champagne as I can. One of the best things about being in Champagne recently was that I had the opportunity to vastly accelerate my learning about the different terroirs. Vincent Laval of Georges Laval pouring vin clair - Chardonnay from Les Chênes. If you visit a Champagne producer a few months after the harvest but before the following spring, and if you are lucky, you will have the chance to taste vin clair, the base wine that eventually becomes sparkling wine. Some producers vinify all of their parcels separately and you might taste them one after the other, listening as they describe the characteristics of that particular place, comparing the taste of a Chardonnay from an the middle of an east-facing slope with hardly any topsoil to a Chardonnay from the same village, but from a sandy parcel lower down on a south-facing slope. The wines smell, taste, and feel different from one another. Tasting and then blending of vins clair has typically been the purview of the wine maker and his or her team, a behind the scenes affair. Peter Liem told me that it was only about ten years ago when critics began to taste vins clair. "I want to truly understand the wines," he said. "To do that I need to taste them from the beginning as vin clair, before following their development in bottle." Peter's post on his old Besotted Ramblings blog demonstrates the kind of learning one can do when tasting vin clair. 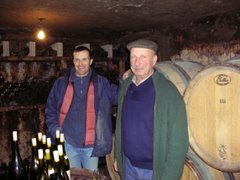 The first estate that Peter and I visited last week was Chartogne-Taillet in Merfy, and the first thing we did was taste vins clair. 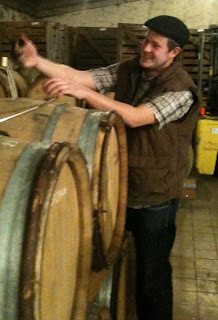 Alexandre Chartogne dipped a pipette into a barrel of Chardonnay from Les Heurtebises, a vineyard of sand and limestone. This is the base wine that becomes Chartogne-Taillet's Blanc de Blancs. 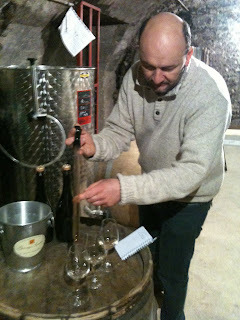 I had a similar experience when tasting vins clair at Champagne Philipponnat in Mareuil-sur-Aÿ. Philipponnat is the sole owner of one of the most famous vineyards in Champagne, the Clos des Goisses. Clos des Goisses is a very well exposed severely steep vineyard and is one of the warmer sites in Champagne. Export Manager Vianney Gravereaux said that the grapes regularly achieve 12% potential alcohol, compared with between 10 and 10.5% in most of Champagne. It is a large vineyard at 5.5 hectares, long and narrow with many different parcels, a bit more than half Pinot Noir and the rest Chardonnay. There is not much topsoil over the abundant chalk. We were lucky enough to taste two vins clair from the Clos des Goisses, a Pinot and a Chardonnay. Although the character of the grape was discernible in both wines, they shared a powerful floral fragrance and an exquisite depth and richness while maintaining great detail and finesse. This, not the grapes, defined the character of both wines. All of this said, what strikes me the most in reflecting on these experiences is that in the end, I learned how much that I don't know. For example, how to translate this new understanding of certain Champagne terroirs via vin clair, to understanding what I am tasting and smelling when drinking a bottle of the finished product? 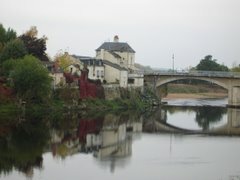 I just returned from several days in Champagne! In Peter Liem, I had the finest tour guide imaginable. I'll share stories and photos in the coming days, but first a few tidbits from our one day in Paris. The French love Sharon Stone. 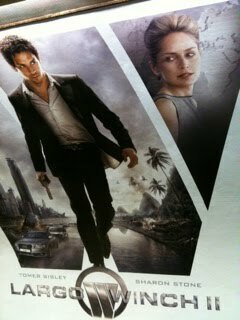 This movie poster appeared in every metro station I passed through. She is something like 65 years old, but in France she's still a leading lady. I hope that I never stop feeling thrilled by the streets of Paris. It was a Sunday and instead of dealing with crowds at museums, we pounded the pavement and devoted ourselves to the gastronomic arts. We ate lunch at Le Comptoir de Relais in the 6th Arrondissement. At lunch this place specializes in French "grandma" cuisine, country food that although rustic, is beautifully served and completely delicious. At night this is a "gastronomique" restaurant with far more lofty aspirations, and the few tables are booked two months in advance. We ate several great things at Le Comptoir, my favorite among them a thick slice of pork foot and green lentil pâté served with an equally thick slice of bread, pickled red onion, and horseradish cream. The wine list is very good at Le Comptoir, offering interesting things at all price points. The 2009 Houillon/Overnoy Arbois Pupillon Poulsard was truly fantastic, one of the best versions of this wine that I've drunk. And it was perfect with the food. This is a wine that might show best before it travels over the ocean. No sulfur added, after all. We burned off lunch by walking all the way back to our friend's apartment in the 20th. That way we would have room for dinner at Le Verre Volé. I first read about this place on Bert Celce's Wine Terroirs several years ago and I've always wanted to go. We decided that we would drink Champagne. Vouette et Sorbée Extra Brut Blanc D'Argile was delicious, although oddly not as great as the bottles I've had here in the States. Peter guessed that it might have been in the very cold refrigerator for too long. 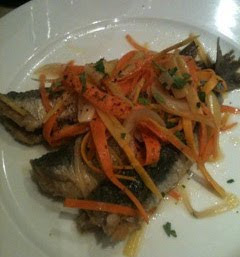 I ate a great plate of sardines en escabeche followed by an Andouillette. This earthy* sausage is made of tripe, and as a specialty of the city of Troyes, is not as odd of a pairing with Champagne as you might think. I enjoyed it, but it I was jet lagged and the sausage was incredibly pungent, and I had to throw in the towel at about two-thirds of the way through. No towels were thrown in on the Champagne, however. Selosse is part of (a leader of?) what I'm learning to think of as a new school in Champagne. The wines are barrel fermented and the style is quite oxidative, which to my palate underscores their incredibly vinous depth. This bottle of Initial was one of the best Selosse wines that I've ever had - amazingly fresh and vibrant with very clean and long salty and chalky flavors. When the wine shows this kind of freshness, it balances and elevates the rich and oxidative character, and it was a truly special bottle. * "earthy" in this case is a euphemism. The Andouillette offered many pungent smells, one of which was poop. I found myself alone in the house on a recent evening, and starving. There wasn't a whole lot in the fridge though, just a hodgepodge of leftovers. Carrots and rutabaga that I roasted with a chicken earlier in the week and forgot to eat, a slice or two of brisket and a bit of the braising liquid, some rather dry leftover white rice, and other random items. The plan took shape - leftovers soup. The braising liquid could be the broth, and if I added the juice from a can of San Marzano tomatoes, it might be only reasonably beefy, as opposed to tremendously beefy. Sauté a bit of onion with a sprinkle of pimentón, add the rice and some salt and toss well, add the carrots and rutabaga. I pushed the combined braising liquid and tomato juice through a sieve and added it to the pot, brought that almost to a boil, added the chopped brisket pieces, simmered for a minute, and that's it. A soup of leftovers, and deeply satisfying too. So that's the dish - beef soup with rice and vegetables. Please, you be the sommelier. What would you serve with this dish? Leave your ideas in the comments and in a few days I'll share what I drank and whether or not it was a good match. The other night, wine importer Joe Dressner was honored by a large group of his colleagues, clients, and friends. To be honored by the people who one actually works with - that is a very high honor. And it is well deserved in this case. Joe and his partners are creative and highly intelligent about the growers and producers they work with. 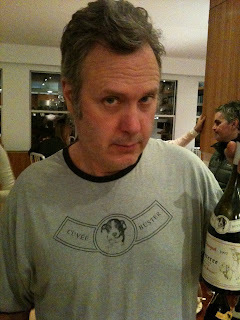 Joe believes in wines that many people would dismiss as too hard to sell, too "weird," too esoteric. But they are fine and very fairly priced wines that in many cases inspire almost fanatical loyalty among their many fans, and they are here for us to enjoy because Joe and his partners staked everything on them. As you already know if you follow Joe's blog or interact with him in the wine business, Joe is recovering from his second major brain surgery. As would be expected, he hasn't been gallivanting about town lately. It was great to see him the other night - everything is the same, I'm glad to report. Same sharp wit, same appreciation of good wine and food, same general attitude, same Joe. Mentally, anyway. I'm sure he feels like utter crap a lot of the time. It was a great party. Lots of people turned up with interesting and fantastic bottles of Dressner wine. I'm talking about 1991 and 1992 (I think) Domaine de la Pépière Muscadet, several vintages of Clos Rougeard, including a phenomenal 1997 Saumur-Champigny Les Clos, 1997 and 2000 Thomas-Labaille Sancerre Cuvée Buster Les Monts Damnés, 2001 Houillon/Overnoy Savagnin, and more. Our gracious host made a vat of delicious mushroom and shrimp risotto. Some one recently back from Italy one brought a wonderful sausage. Some one else brought some lovely cheeses. Some one else smoked a wagyu brisket. Another guy wore a special shirt. Thank you Joe, for the many years of work you've done to make it so that I can buy and share world class wines with my friends and family. I, and I'm sure all of my readers (except that woman at a tasting who you wouldn't allow to try the Ulysse Collin after she said the Larmandier-Bernier was too dry) wish you improved health and comfort in the coming years. We're glad that you're here with us! This past weekend I participated in one of the greatest wine events of my life. Neal Rosenthal and his wife Kerry Madigan made lunch for a group of people and opened a slew of wines to share. This was not a business lunch. The only wine business people in attendance were people who work for Neal and Kerry. Well, one wine business guy was there, Levi Dalton, but he was there to celebrate the wines and the company. His post about the event is far more poetic than mine, by the way. This lunch happened in part because Neal genuinely loves to share his old wines with people who will share his delight in them. For the lucky guests, it was a guided tour of the early days of Rosenthal Wine Mechant's French portfolio. Neal served the wines and we talked about them as we ate, thought about them, heard stories about the people who created them, about the different time in which they were made. The wines were very special. Old vintages, stored undisturbed in Neal's underground cellar. They showed what great wine is capable of when taken care of properly for 20-plus years. It is tempting to list the wines and to share notes with you - these are some of the greatest wines I've had. But that just doesn't feel like it's in keeping with the spirit of the event. Here's the thing - we crammed into several cars and drove from NYC where the snow was in gray and black piles against the parked cars, to the hilly horse farm country of mid-state New York. To an oasis of perfectly cellared wine and delicious wholesome food. Everything was covered in a pristine white blanket. The sun shone brightly, and the collective mood was high. We truly enjoyed each others' company and everyone there recognized how special of an experience it was. There was no note taking, point scoring, chest thumping, one-upping, well-I-once-drank-a-1952 recounting, check listing but not truly drinking and understanding, nonsense. We drank a mature Blanc de Blancs Champagne out of magnum, and it showed how majestic Champagne can be in the large format. The wine felt fresh and vibrant, as if it was still expanding. Amidst the honeyed tones there was a palpable richness in flavor and texture, not the elegant chalky sense one might expect. This is because the wine is from a place that actually favors and specializes in Pinot Noir, not Chardonnay. The terroir left a stamp here that after 25 years continues to speak as loudly as the grape. We drank several outstanding wines from the 1983 vintage, considered to be very difficult, an off year. The wines, though, were spectacular. A reminder to buy wines from the producers that you love, even if from the off vintages. Who knows what they will turn into when they're fully mature? We drank three mature white Burgundy wines, one from Meursault, one from Puligny, and one Corton-Charlemagne. In the hands of these producers, and after their long sleep in a proper cellar, they could not have spoken more clearly about their places of origin. Here is what they said to me: Meursault is a little bit oily in texture and smells a bit like hazlenuts, and the Perrieres vineyard is all about stones. Puligny is more elegant, lighter in body, but firmly structured, and can take on complex mushroom and incense aromas when mature. Corton Charlemagne takes a long time to come around, but then shows amazingly complex aromas, and minerality and acidity that seem never to fade. 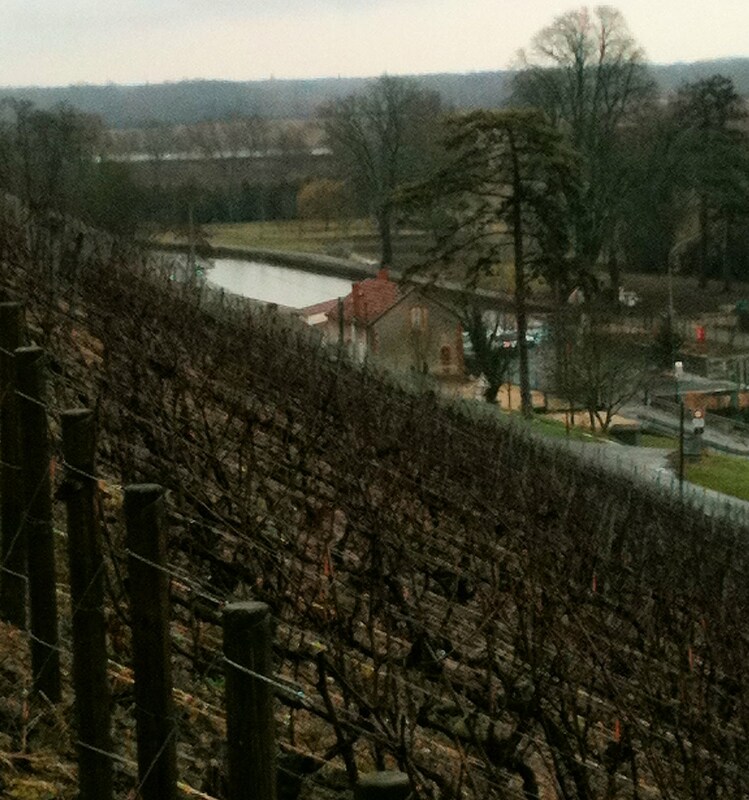 We drank a wine from the Gaudichots vineyard, the great vineyard that decades ago was carved up to create La Tâche. The aromatics were amazing, and reminded me of why if I had to take one and only one wine with me to a desert island, it would be something from Vosne-Romanée. We drank one wine blind and talked about it a bit. I thought it was an early '80s Barolo or Barbaresco. Someone else agreed that it was Italian. 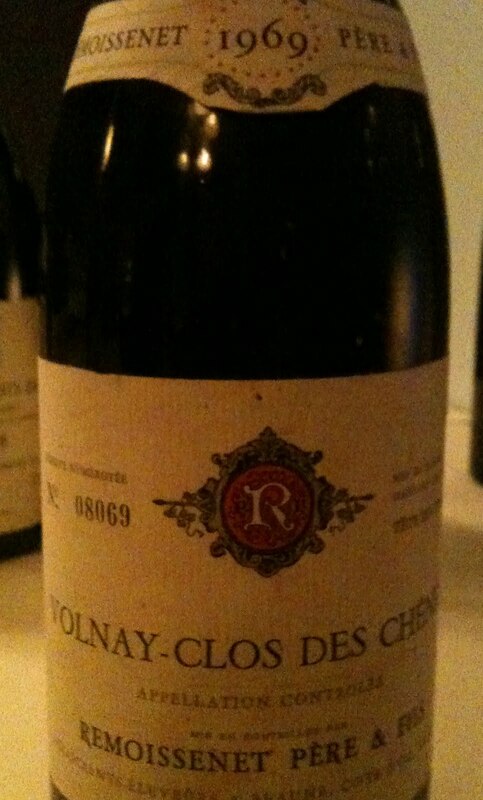 Another fellow disagreed, saying that the wine didn't have the mouth feel of Nebbiolo, that this was more Burgundy. Everyone enjoyed the wine, and everyone was surprised when it was revealed to be a California Pinot Noir from 1976, a time when a lot of great wine was being made in California in the gently extracted and low alcohol old-world style. We drank a first-growth Bordeaux from the 1978 vintage that Neal purchased upon release. The wine was delicious and it was fascinating for me to drink, as I had never before drunk a first growth Bordeaux with that kind of age. And no one felt guilty for saying that although it was undeniably excellent wine, it didn't make our hearts leap the way the nose on the 1983 Clos de la Roche did. Or any of the Burgundy wines did. We drank a wine from Hermitage from a producer I was unfamiliar with, and although I hesitate to make superlative statements, this was without question the finest northern Rhône wine that I have ever tasted in my life. 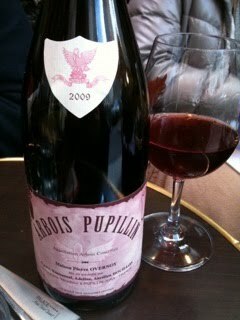 It was the color of Poulsard, not really much more than rosé. 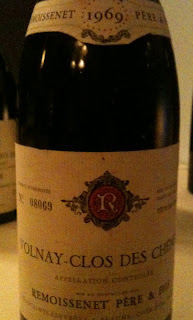 This wine had the structural phenotype of Burgundy, but with entirely different aromatics. Such intensity - rose petals, peppercorns, herbs, and all infused with this persistent animale tone. An inspiring wine that made me feel a bit sad about the rather uninspiring state of the nothern Rhône today. We ate wonderful cheeses, various fruit tarts, and talked some more. Daylight slipped away and the sky turned a dusky cobalt blue. We drank strong coffee and found some or other excuse not to find our coats and shoes, not to leave this place and this magical afternoon. But leave we did, and we left grateful and elated. And we will see each other again. Thank you for a truly memorable afternoon Neal and Kerry, and everyone else too. The other night, I cooked a rabbit for the first time. My friend Peter was coming over for dinner and I wanted to try something new. We used a simple recipe from The Art of Eating #76 called Lapin à la crème, or Rabbit in white wine with cream. The first task was to butcher the rabbit. The recipe calls for "stiffening" the rabbit in butter (cooking but not browning), sweating some aromatic vegetables, returning the rabbit to the pot and braising it with the aromatics in white wine and stock for 45-60 minutes until tender, removing the rabbit and then reducing the braising liquid. Then straining the liquid and adding some cream (although the recipe called for adding the cream before straining, but that didn't sound right to us). Then cooking some mushrooms - we used hedgehogs, returning the rabbit to the sauce with the mushrooms to marry the flavors, and adding white pepper and lemon. We substituted parsley for the white pepper and lemon. I must say, the braising liquid and the rabbit smelled great. We plated our rabbit portions over a mound of plain white rice, spooned some of the sauce over the top, sprinkled with parsley, et voila. Rabbit is a very lean meat, more gamy than heavy. This sauce is delicious, but not terribly pungent or complex. What to drink with this dish? James MacGuire in The Art of Eating writes "With the rich but not unusually flavorful sauce of rabbit with white wine and cream, you might drink a dry or near dry, fresh, aromatic Alsace Riesling or Pinot Gris." That sounded good to me, but I had no Alsace wine in the house. 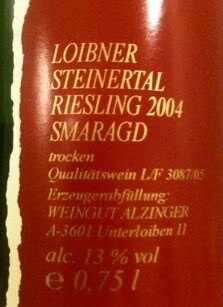 So I opened a bottle of the most aromatic Riesling that I had, the 2004 Alzinger Riesling Smaragd Loibner Steinertal, $30, Imported by Michael Skurnik Wines. According to Peter, Alzinger's Steinertal is one of the absolute greatest white wines of Austria. So yes, it is possible to buy one of the greatest white wines in the world on closeout for $30, and the new vintage (2008) costs under $65, by the way. Anyway, this wine was vividly fragrant, delicate and finely focused, and very intense with a great presence on the palate and a lazy lingering finish. It was a lovely match with the rabbit. I thought it was just a spectacular wine. And it held up for next three days, too. All of that said, I liked but didn't love my rabbit. I didn't achieve that falling off the bone texture that the recipe suggests. What do you think - have you cooked rabbit with any success? I'm willing to try again but I need a little inspiration. I might prefer simply to drink the Steinertal. Not all Champagne is sparkling wine. 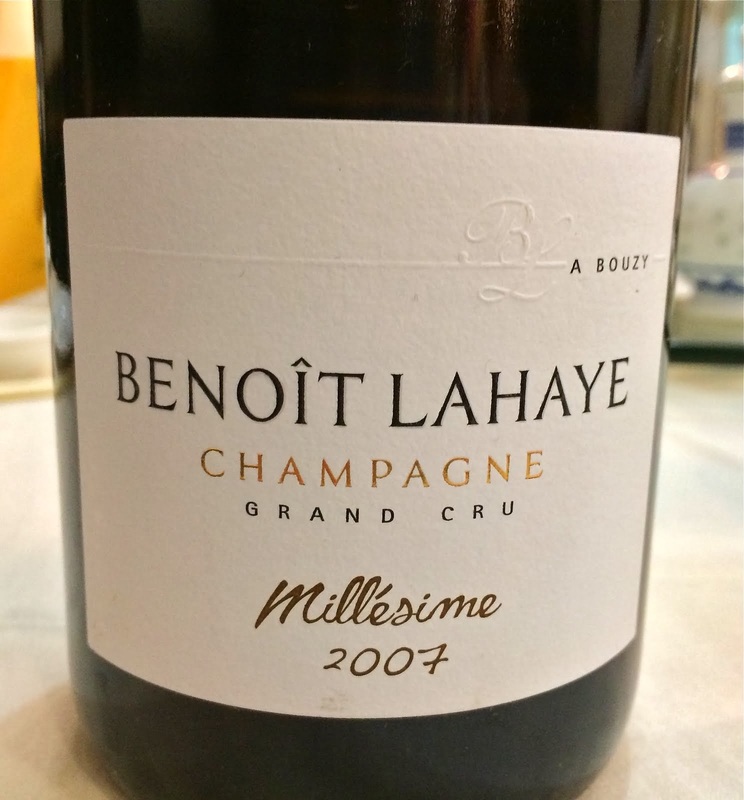 Peter Liem, many of whose comments and ideas are paraphrased within this post, told me that the modern history of sparkling Champagne is only 300 or so years old, and that Champagne used to be a still wine. Many Champagne producers continue to make small amounts of still wine, called Coteaux Champenois. If you've never heard of these wines or never tasted one, you are most certainly not alone. Not a lot is made, and most of what is made is consumed in Champagne. The grapes used to make Coteaux Champenois are the same highly valuable grapes that could be used to make Champagne - it just doesn't make good financial sense to divert production from a highly profitable wine that is in demand all over the world to a little known wine that is harder to sell at the same prices. So why is Coteaux Champenois made at all, given that logic? Well, producers need still red wine if they make a rosé of Champagne by blending still red wine into sparkling wine. Also, people in Champagne enjoy drinking red wine from time to time and from what I gather, in much of France, you drink the local wine. Perhaps most importantly, Coteaux Champenois continues to be made because some producers want to honor the tradition and history of Champagne. "Take Larmandier-Bernier, for example," Peter said. 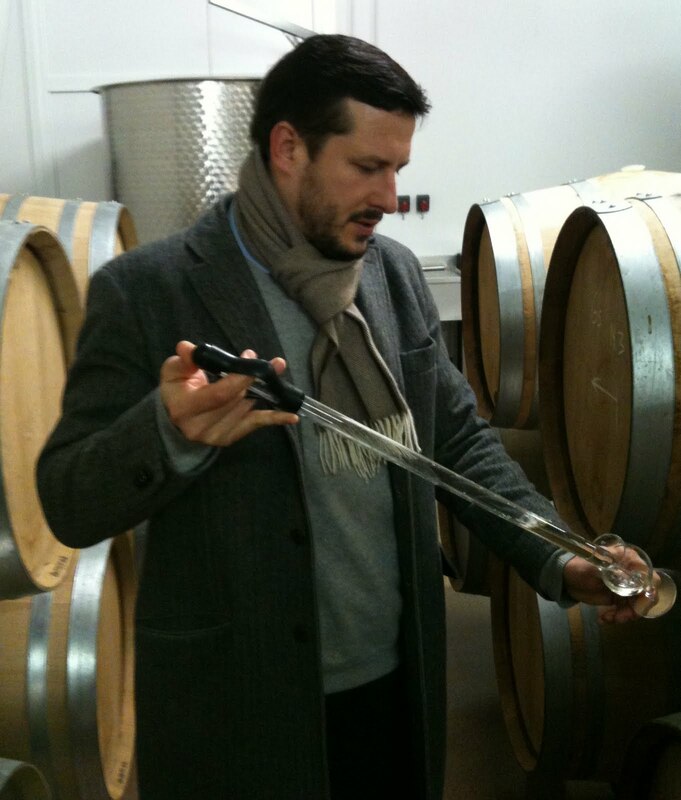 "Pierre Larmandier wants to make red wine from Vertus Pinot Noir because he wants to preserve the history of Vertus." Coteaux Champenois can be red, white, or rosé, although the red wines are by far the most common. 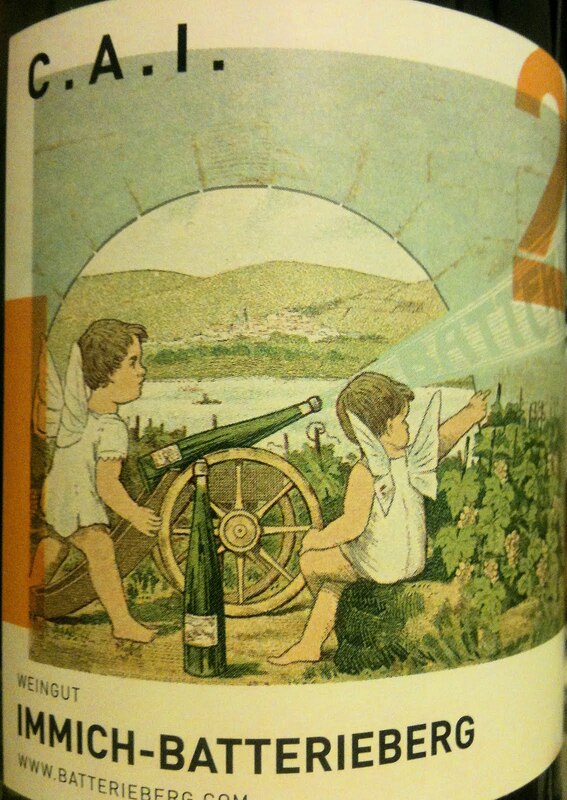 The wines can be released as vintage wines or non-vintage wines, and do not need to be aged in bottle for three years, as sparkling Champagne does, in order to be labeled as vintage wines. The villages where Pinot Noir thrives are also the villages that make highly regarded Coteaux Champenois. Bouzy and Ambonnay are perhaps considered as the sources of the finest wines, but there are excellent wines made elsewhere too. There are very few examples of Coteaux Champenois available at retail stores. Importers have trouble selling the wines, and so they don't bring them in. "I have trouble selling them, especially a non-vintage still red wine from Champagne that would retail for $50," said Kevin Pike, Director of National Sales and Marketing at Michael Skurnik Wines. There are retailers, however, who believe in these wines enough to keep them in stock. Joe Salamone at Crush in Manhattan, for example, has been selling Coteaux Champenois for years, when he can get his hands on it. Last summer I drank a bottle of 2002 Larmandier-Bernier Coteaux Champenois with a few friends and absolutely loved it. I knew I needed to try more. A few friends agreed, and we decided to buy whatever we could and to hit up a few importers for bottles that are not (yet?) available in stores. 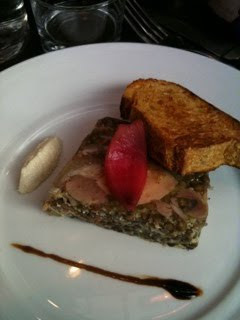 We recently got together over a completely fantastic dinner at Prune and drank the wines. It was quite a crew, including the aforementioned Peter Liem, Joe Salamone, and Kevin Pike, and also Levi Dalton of Alto (where at least one Coteaux Champenois is on the wine list), Dan Melia, Clarke Boehling, and Keith Levenberg. 2008 Roger Coulon Coteaux Champenois Blanc, $40-50, Rosenthal Wine Merchant. I found myself saying "this wine smells just like Champagne!" It really does, just like a Blanc de Blancs. Tastes just like one too. Feels entirely different, obviously, and it was a strange sensation. This was the very first Coteaux Champenois Blanc I've ever tasted, I think I need more experience before saying much. 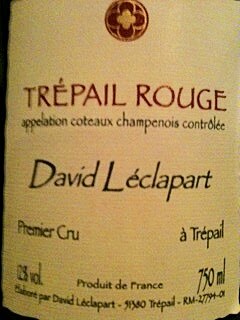 2008 Léclapart Coteaux Champenois Trépail Rouge, $55, Imported by Jandell Selections. Very fragrant, fresh red berries and flowers with woodsy undertones, very persistent. There is a "natural streak" here, as there often is in Thierry Puzelat's wines, for example. Bottle variation is significantwith this wine, apparently. This was a good bottle, the one I drank a few months ago was not as good. 2008 Egly-Ouriet Coteaux Champenois Ambonnay Rouge, $95, Imported by Michael Skurnik Wines. 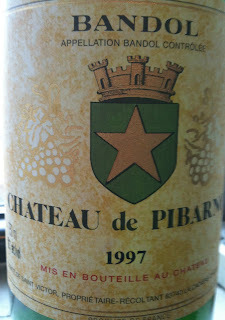 The nose is dominated by oak right now, and I found it hard to enjoy at this early stage, even harder to evaluate. Peter Liem told us that among many people in Champagne, this wine is considered to be the best Coteaux Champenois. I'd love to taste the '08 again in 5 or 10 years. 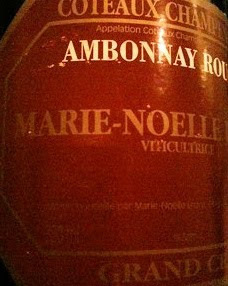 2001 Marie-Noëlle Ledru Coteaux Champenois Ambonnay Rouge, not imported (kindly donated for this tasting by Charlie Woods, whose company Bonhomie Wine imports Ledru's sparkling Champagnes). Still shows freshness, there is complexity on the nose, which becomes more layered and detailed with air, perfectly harmonious on the palate. Delicious, and one of my favorites of the tasting. 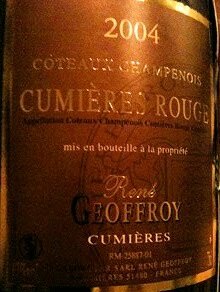 2004 René Geoffroy Coteaux Champenois Cumières Rouge, $55, imported by Michael Skurnik Wines. The nose is spicy, rich, voluptuous, and also energetic with dark fresh fruit. This is a powerful wine that doesn't lack for concentration, but still offers god detail and balance. I like Geoffroy's wines very much, and this was no exception. 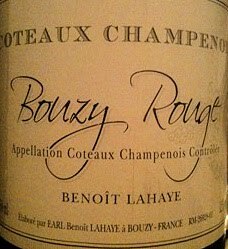 2003 Benoît Lahaye Coteaux Champenois Bouzy Rouge, not imported (kindly donated for this tasting by Jeffrey Alpert, whose company Jeffrey Alpert Selections imports Lahaye's sparkling Champagne). "Bouzy Rouge" has got to be one of the best names in the world of wine. My favorite wine of the tasting. The nose opens slowly (as with all of Lahaye's wines) but shows real elegance, especially in light of the very warm 2003 vintage. Mineral infused spicy red fruit on the nose, and a harmonious palate whose delicate red fruit shows a bit of maturity and although reflects some of the opulence of the vintage, for me didn't cross into over-done territory. 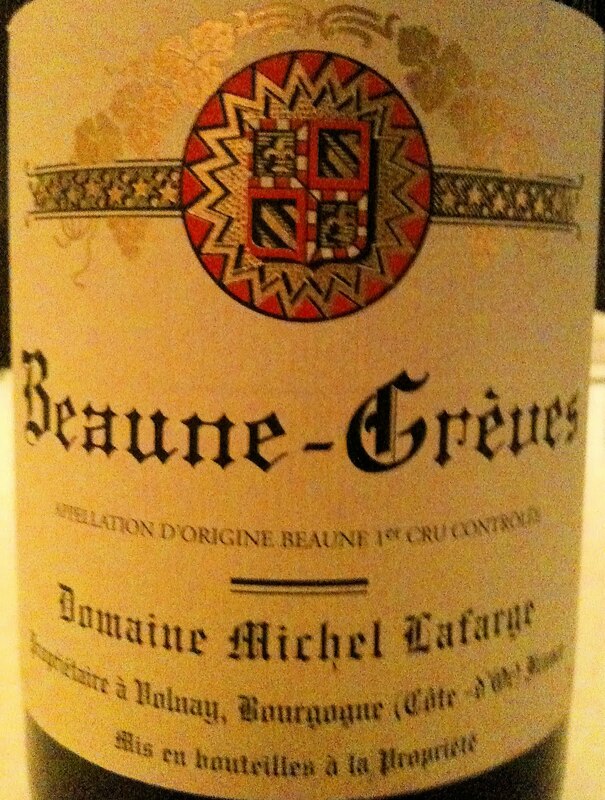 Delicious wine, and Lahaye is an absolute star, in my book. 2000 Jean Vesselle Coteaux Champenois Bouzy Rouge, $41, Dionysos Imports. This wine showed a candied aspect that I didn't care for, and I found it to be a bit one-dimensional, uninspiring. But there were others who enjoyed it, so grain of salt here. 2002 Paul Bara Coteaux Champenois Bouzy Rouge, $40, Imported by Jandell Selections, although bara's sparkling Champagne is imported by Kermit Lynch. This wine was corked, which is a shame because in an odd coincidence I happened to drink a glass the night before this tasting, and it is wonderful wine, very intense but also very light in body, a truly excellent Coteaux Champenois. 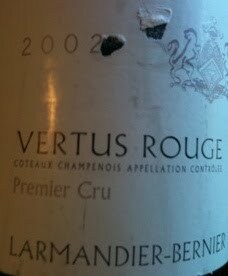 2002 Larmandier-Bernier Coteaux Champenois Vertus Rouge, $40, Louis/Dressner Selections. This bottle did not show as well as the others that I've had. It was very reduced, even after an hour open, so we decanted it and it was much better. Similar in style to the Bara wine - purity, finesse, freshness, lightness in body. The fruit is rich and vibrant and the wine is well balanced, but it never became as good as other bottles that I've had. This bottle notwithstanding, this particular wine is the finest Coteaux Champenois that I've had. 2002 Bollinger Coteaux Champenois La Cote aux Enfants, $120, Imported by Terlato Wines International. Shows nothing of what makes Coteaux Champenois appealing. 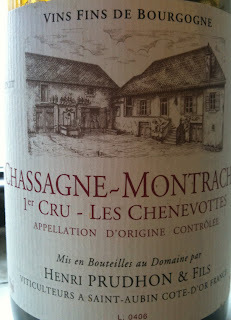 Overripe grapes, rasiny, too concentrated, chunky and not graceful, jut not enjoyable wine. I normally wouldn't condemn a wine like that, but I believe that everyone at the table felt approximately the same way, and so it's safe to say that my take on the wine is not an outlier. Bollinger is so great too, so this wine was quite confusing. The first rule of Burgundy Wine Club is: you do not talk about Burgundy Wine Club. The second rule of Burgundy Wine Club is: you do not talk about Burgundy Wine Club. We've only just begun and I'm breaking rules already. But blogging about it isn't exactly the same as talking about it. What do you do if you want to experience some of the greatest wines of Burgundy, but you don't have the money to make it happen? I started Burgundy Wine Club. Seven friends and I chip in money each year and share the cost (and the risk) of buying expensive bottles. We get together over a great meal and drink about 8 bottles of wine. There should be a theme to the wines, although this will be difficult in the early years. The goal is eventually to have dinner together twice a year, but we need to build our cellar in order to do that, so we meet once a year for now. These 7 friends have entrusted me with the responsibility for selecting the wines, which is quite an honor and a pleasure. It's also a challenge. Each year I need to use our money to buy some wine for the following year's dinner, some wine for the long term, and also some wine that should be drinking well in the mid-term so that we can eventually meet twice a year. Buying newly released wine for the cellar is the easy part. I think of a theme that should be interesting to the group and find the wines - done. Mid-term wine is also not so tough, although it's sometimes tough to find the bottles that I have in mind. Buying mature wine to drink immediately is much more difficult, as although we are each kicking in real money, it's too expensive to buy old Chambertin, for example. A 1993 Rousseau Chambertin sells for about $1200 - budget blown. I have to be creative and try to find bottles that fit together in some way and that will offer lots of pleasure and interest. We just had our first dinner and I must say that it exceeded my expectations. Not necessarily in the wine department, although there were some beauties. It was a great group of people and we had a ball together, and we dined in comfort and style at Alto where my good friend Levi Dalton took care of us in his typical gracious style.Here are the wines we drank along with a couple of thoughts. I'll provide the prices I paid too, although you might find these wines priced higher or lower at auction or in different parts of the country. 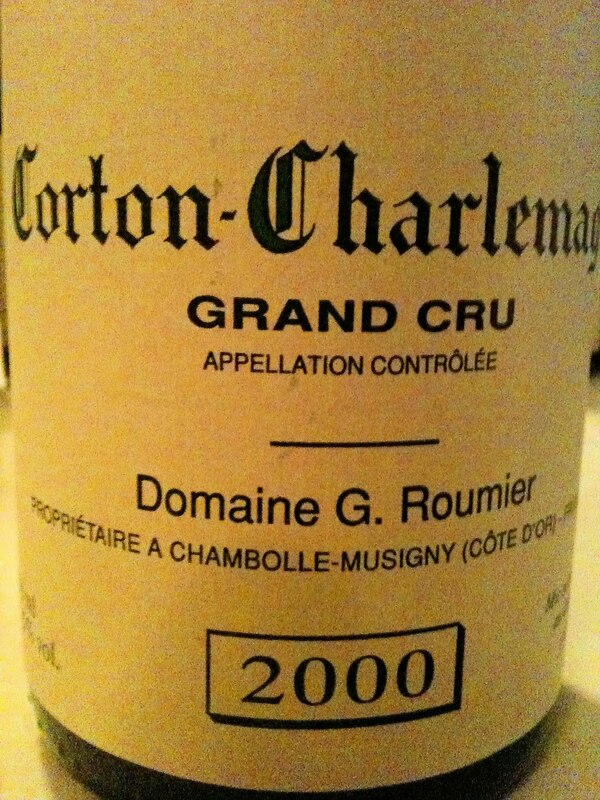 We began with two Corton Charlemagnes from the 2000 vintage. I know - white Burgundy from that time is very risky because of the premature oxidation problem, but no risk, no reward. I don't hear Corton-Charlemagne mentioned in the same breath as Puligny, Chassagne, or Meursault in terms of quality. Two members of our group who have a lot of experience with the wines told us that Corton-Charlemagne requires much more time in order to fully express itself, and that it might be undervalued in relation to those other illustrious wines because when young, the wines can be simple and not all that interesting. Our wines would be only 10 years old, but from a vintage that might produce wines that are ready to drink at a younger age. Levi paired these with an organic egg raviolo with winter mushrooms, and crisp sweetbreads. It was really, really good. 2000 Boneau du Martray Corton-Charlemagne Grand Cru, $100. Premoxed! The very first wine of our very first dinner and it's wrecked. It tasted like butterscotch and Madeira after 10 minutes open and showed almost nothing of why Corton-Charlemagne can be great, especially in the hands of perhaps its most classically revered producer. 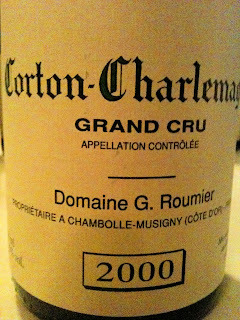 2000 Georges Roumier Corton-Charlemagne Grand Cru, $175. Everything that I hoped for, and more! What struck me about this wine was the way it packed so much into such a fine texture and body. Laser-like in its focus, lean and energetic with a firmly mineral core. There are nuts and white fruit and flowers that flirt about on the surface, but more about stone, and it is precise, elegant, seamlessly balanced, and we all though it very beautiful. Gorgeous now but there doesn't seem to be any reason to rush. We then had two wines from the Grèves vineyard in Beaune. Perhaps not as illustrious as Chambertin, but can be excellent in the right hands. Levi paired these with country-style oxtail and foie gras terrine - excellent. 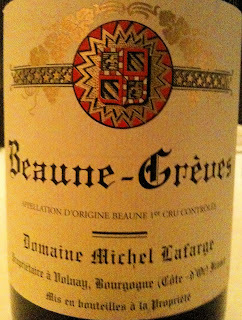 1996 Michel Lafarge Beaune 1er Cru Grèves, $60. Immediately obvious that this was showing beautifully. More approachable than a bottle I drank several years ago. Lafarge is one of the great old-school masters in Burgundy and this "little" wine illustrates this. Dark and spicy fruit that is still youthful, although gentle, over a firmly mineral floor. There is no excess weight whatsoever - the thing about this wine that most impressed us was its sense of complete harmony - totally seamless. Then came a flight of Volnay from 1998 - two from Santenots in the far south of the appellation, a vineyard that technically is located in Meursault, and one from just north of the village. The contrast in terroir was equal to the contrast in style among the wine makers. Levi paired these with quail stuffed with mortadella - perfect. 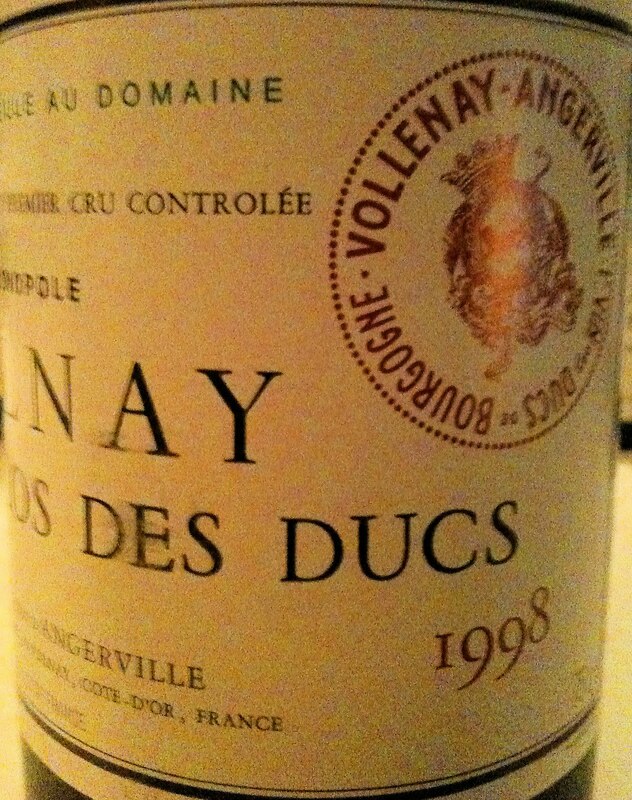 1998 Marquis D'Angerville Volnay 1er Cru Clos des Ducs, $138. 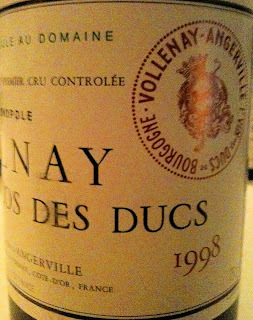 This is one of the iconic wines of Volnay, from a great vineyard that is a monopole of the Marquis D'Angerville. This truly excellent wine can be had for under $100 in current vintages, by the way. 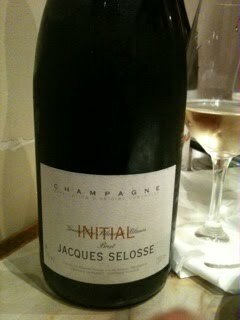 This one was a bit reticent at first, but it opened up to show tiny wild strawberries on the nose over lots of chalk - serious chalk, Champagne style chalk. The character is one of weightlessness, finesse and elegance. Well balanced on the palate, layered and complex, and absolutely delicious. The finish shows some drying tannins, but not intrusively so. This wine is not at all at its apex, but it was expressive and delicious to drink now. A wine I would eagerly drink again, from any vintage. 1998 Domaine des Comte Lafon Volnay 1er Cru Santenots-du-Milieu, $99. Somewhat disconcerting for the first 20 minutes or so, as the nose was entirely mute and the palate somewhat uni-dimensional. But 45 minutes in and the wine opened up a lot. Both of the Santenots wines were richer in character than the Clos des Ducs. The nose here shows lots of earth and clay and also some herbs, and dark fruit that is in that nice secondary stewed place, too. The palate showed a much greater intensity than the nose, and really shined in its clarity and layered flavors. I liked the sense of restraint and class. 1998 Domaine Leroy Volnay 1er Cru Santenots-du-Milieu, $150. This was the one we all gravitated to as they were first poured because the nose was exuberant with richly ripe dark fruit and violets that literally wafted up from the glass. "Uncharacteristically open and generous," said one experienced Leroy drinker. This wine smelled great and tasted delicious, pure and energetic and fresh. But many of us preferred the other wines as they opened up, as they offered a different degree of complexity and depth. But if you enjoy the rich and dense Leroy style, this wine was certainly lovely. We closed out our evening with two bottles of Volnay Clos des Chènes from the 1969 vintage by Remoissenet. The modern wines by Remoissenet are not so interesting, in my opinion, but apparently in the old days when it was more common to sell off great material to the negociants, they made some very good wines. Why two bottles of this one wine? Well, I couldn't find another comparable old wine, and what if one of them is flawed? And in fact, one of them was flawed - way more advanced than the other, oxidized notes and generally tired. Levi paired this with braised veal cheeks with creamy polenta - inspired. I have a lot of wine glasses, but they are mismatched, as I have broken many over the years. I have three Ravenscroft glasses, for example, that I use for Cabernet Franc and Syrah. I had four but I broke one. I replaced it one day before hosting a dinner in which I knew that an old Bordeaux would be served, but I have since broken another one. I had two of those enormous Riedel Burgundy glasses - BrooklynLady and I were given them as a gift for our wedding. I broke one while cleaning it, as the stem simply decided that it needed separation from the bowl. Then a friend gave me his two to babysit while he lives out of the country, so now there are three. Things break, such is life. I find myself using basic Schott Zwiesel white wine glasses for all white wine and most Champagne, and for Beaujolais too. I don't often use the few great glasses that I have because they are large and very fragile and I don't have a good track record regarding their safety. Do the aromas and flavors of wine show differently in different types of wine glasses? This is a question that in and of itself can annoy some people. I can understand the annoyance factor, as this is a topic is too often discussed in a snobby way. By snobby, I mean that the tone used in writing or talking is dismissive and condescending, or can make people feel as though the knowledge required to appreciate differences in glassware is unobtainable. This is a shame because unlike the art of pairing wine with food, which is also too often discussed snobbishly, and in which I would argue that there is no absolute correct answer and in which creativity and personal preferences are key, there is a science to making good wine glasses. Some wine glasses simply are better than others. I'm not saying that wine cannot be enjoyed unless the proper glass is used - that's obviously rubbish. We all have our stories about a simple white in glass tumblers at a seaside restaurant, and rosé out of paper cups in the park on a sunny day with friends. That is soulful stuff and what I am saying does not preclude loving those experiences. I am saying, however, that certain glasses do bring out the best in a wine, and experiencing this firsthand can be compelling. The other night three friends and I had dinner and drank several great wines. Clearly this was an occasion to break out the best glasses. One of the wines I served was the utterly excellent 2001 Domaine Fourrier Gevrey-Chambertin 1er Cru Champeaux, $65, Imported by Neal Rosenthal Wine Merchant. Unfortunately I had only three Riedel Sommelier Series Burgundy bowls, so I drank from a Riedel Oregon Pinot Noir glass - no problem. But one of my friends surprised me by bringing another great Burgundy, the 1998 Claude Dugat Gevrey-Chambertin 1er Cru Lavaux St. Jacques, price unknown, Robert Kracher Selections. I wanted to serve these wines together with one of the dishes we ate, so I needed 8 Burgundy glasses and had to use my "daily" Burgundy glasses, the Schott Zwiesel Tritan Burgundy bowls that I bought a while ago, and that so far have resisted breaking regardless of the abuse I regularly subject them to. We had several types of glasses on the table, and an unintended opportunity to compare them with these two great Burgundies. The Riedel Sommelier Series Burgundy glass (about $100 each) is the insanely large one on the left. The Riedel Oregon Pinot Noir glass (prince unknown) is in the middle and the Schott Zwiesel Tritan glass ($10) is on the right. We didn't take notes or anything, but I can tell you that I absolutely loved the Fourrier wine in my Schott Zwiesel glass, with its beautiful stone floor and graceful dark fruit, and its striking sense of harmony. And then I tried it using one of the Riedel Sommelier Series glasses and it honestly was a different wine, and it was even better. In the larger glass more complex gamy notes emerged, and the wine seemed to be even more layered and complete. I loved the wine, and I'm sure I would love it from any vessel, but it was better out of the Riedel Sommelier Series glass. From the Oregon Pinot Noir glass the wine for some reason showed more alcohol on the nose and on the palate. Thanks to my mismatched wine glass collection, we were able to repeat this experiment with 2001 Clos Rougeard Saumur-Champigny Les Poyeaux, $45, Louis/Dressner Selections and several different glasses meant for Cabernet-based wines, and again the large Riedel Sommelier Series glass (I have only one) brought out the very best in the wine (which is fantastic, in any glass). So what does this all mean? For me, it means that I will start using my best glasses on a daily basis with any wine, including and especially my daily $15 wines. They help to bring out the best in a wine - why shouldn't I use them? If they break, they break. Drinking wine from another glass when I have these superior glasses just sitting there is akin to purposely forgoing part of a great experience. And I might even spring for two of those expensive but supposedly phenomenal Riedel Sommelier Series Champagne glasses, although I would bet the under on my keeping them intact for at least 6 months. December tends to be a good month for wine drinking. Everyone reaches into the cellar for the good bottles to help celebrate the passing of another year. Here are the wines I drank in December that have not, even in passing, appeared recently on this blog. Usually I put them into groups - excellent, very good, and so on, but I had so many great wines in December that I will simply list my favorites without any qualification. 1993 Chateau Laville Haut-Brion Pessac-Léognan Blanc, price unknown, Chateau & Estate Wines. My generous friend Adam shared this treasure with me over his tasty braised veal shanks. First of all, I've had maybe two or three white Bordeaux wines in my life before this one, and none of them were terribly exciting. This one, however, was thrilling. The Wine Doctor profiles the estate here, so you can read up on the details if you like. In short, Laville Haut-Brion is owned by the same people who own Haut-Brion, but the Laville vineyards and wines are distinct. They are made from old vines, mostly Semillon and the balance Sauvignon Blanc. Pungent and still very graceful aromas of orange peel, wax, menthol, and honey. A mesmerizing nose, and one that grew in detail and breadth over the hour or so in which we drank it. Youthful acidity on the palate and perfectly balanced at only 12% alcohol (! ), with a dazzling combination of richness and delicacy to the flavors. Memorable wine, and I suspect that it is a wine that might not exist in this style these days. (2000) Tarlant Champagne La Vigne d'Antan Extra Brut Non-Grefée Chardonnay, $65, was imported by Jon-David Headrick Selections, not sure who imports it now. As described by Peter Liem on ChampagneGuide.net, this wine comes from un-grafted French rootstock in the sandy phylloxera-resistant soils of a vineyard called Les Sables. This is just the second release of this wine (Benoit Tarlant began making it in 1999) and already it is one of my favorite Champagnes. It expresses with incredible clarity the sandy brown tones of the soil. The fruit is piercingly clear, although the fruit plays a secondary role. The fruit and the soil work together so harmoniously, and the wine is both fascinating to think about while drinking, and also just plain delicious.Well worth seeking out. 2002 Domaine Huet Vouvray Demi-Sec Clos du Bourg, $33, Imported by Robert Chadderdon Selections. Such an incredibly beautiful wine, and so accessibly priced. Crystalline purity, elegance and energy, rocks, herbs, honey, and stone fruit are all in perfect balance. The wine is delicious now although it is probably showing only a little of itself. It started to show a spearmint kind of herbal complexity on the finish only after an hour open, and the texture became more energetic and almost grippy after that hour. I'm sure this will last forever but it will be delicious at any point between now and forever. 1981 López de Heredia Rioja Gran Reserva Viña Bosconia, price unknown (but you'd have to pay over $100 in NYC to buy this now), imported by Polaner Selections. A very generous host at a holiday party opened this and also the 1985 and 1991 Gran Reserva Viña Tondonia. They were all great wines and it was interesting to drink them next to one another. The 1991 was just too young, I thought. The 1985 was utterly lovely, but the star of the show was this wine, and it was all class and grace, with deeply complex aromas and flavors, an incredibly elegant mouth feel, and a finish that just didn't quit. Awesome wine, and it's the same price as a newly released 1er cru red Burgundy from a good terroir. One of the best ways to spend $100 on wine, in my opinion. 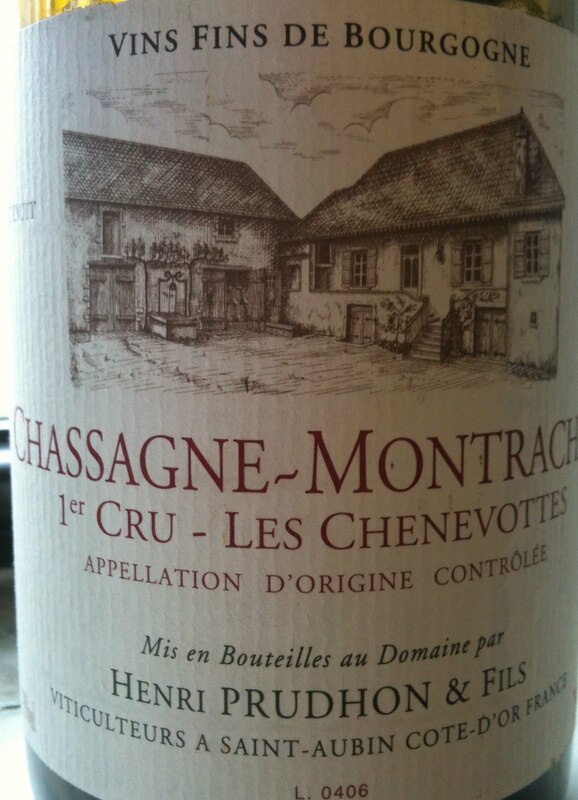 2004 Henri Prudhon Chassagne Montrachet 1er Cru Les Chenevottes, $47, Imported by Neal Rosenthal Wine Merchant. White Burgundy is tough to buy, I think. I want to buy good bottles, but there have been oxidation problems so it's a dicey proposition to cellar them. But the really good bottles take time to fully express themselves. Prudhon's wines are a safe bet, I would say. The range includes some very good terroirs and the wines are made in a classic understated style. Perhaps not the very finest that Burgundy has to offer in white wine, but delicious and expressive of place, and accessibly priced. This bottle was very good when we opened it, but it was day two when it really shined. Slightly smokey and marine inflected aromas that mostly feature stones and rocks. The palate is all elegance and finesse, with good intensity and a grippy finish that smacks of the ripe raw material. And the thing is, this wine is completely light in texture and weight, almost sheer - you have to pay attention to get it. Very impressive. 2007 Bernard Baudry Chinon Cuvée Domaine, $18, Louis/Dressner Selections. This is one of baudry's two "entry level" wines, and it can be simply fantastic. I love it in 2007, and it's drinking better than ever. Showing a mineral pungency and lovely floral tones that weren't there earlier in its life, a bit musky too on the nose. The fruit is a bit less pronounced and the dry leathery earth components are more prominent. Well balanced and great wine and year in, year out, one of the finest red wines that can be purchased for under $20. Yup, I said that. 2002 Louis Boillot et Fils Pommard 1er Cru Les Fremiers, $52, Imported by Neal Rosenthal Wine Merchant. Louis Boillot is Ghislaine Barthod's husband and they will star together in a new MTV reality based mini-series on wine making spouses, their trials and tribulations. Keep an eye out for it. This wine is still young, but certainly showing good detail in aroma and flavor and the minerality is prominent. The fruit aromas are dark and brambly and with air, completely infused with wood smoke. Plenty of extraction here, but the palate is still balanced and lively and with air the minerality takes on a pungency that for me, defines the wine. Very lovely. NV Jacques Lassaigne Champagne Cuvée Le Cotet Extra Brut Blanc de Blancs, $70, Jenny & François Selections. 45 year old vines planted in 10 centimeters of topsoil over chalk in an east-facing vineyard in Montgueux. This is a laser beam of chalky Chardonnay, and because it is farmed so well and grown in such a ripe climate, you'd never guess that it is dosed at merely 2 grams and is technically an extra brut wine. So good, and with an hour of air, terrific. NV Billecart-Salmon Brut Rosé, $75, T. Edward Wines. So silky and refined, such finesse. This wine has earned its reputation as one of the finest NV rosés in Champagne. 1997 Chateau Pibarnon Bandol, about $25 on release, but $54 a few years ago, Imported by Michael Skurnik Wines. Absolutely classic Bandol, with lots of animale inflected tobacco and earth. Offers a lot of pleasure, and it is perhaps just approaching middle age. Very well balanced and the acidity is strong. The tannins are dusty and pretty fine, and the whole package is very attractive and typical of the place. Very strong wine. 2009 Immich-Batterieberg Riesling Kabinett, $23, Mosel Wine Merchant. I'm just beginning to start attempting to engage in trying to begin learning about Riesling. This is one of my favorites so far. I love how it is almost extreme in its focus, but its also so pretty and generous in its flavors. At first it's all orchard fruit but with air time the earthy notes emerge. There are fleeting sponti whiffs, the palate is very mineral, and the wine is well balanced and expressive. Hard to argue with that.